This very interesting report is about how companies can harness networks of employees to improve collaboration. How to create informal networks? (a) By keeping track of who has emailed whom. or (b) By keeping track of who has talked to whom – by programming staff’s mobile phones to keep track of their owners’ location and proximity to other people (for more on this aspect, please see this paper in which Alex Pentland masterfully pieced together the contributions of the Reality Mining project). Why do companies need informal networks? Make change stick by working through influential employees. If management can persuade influential people to be proponent of a big change, it can boost the chance that the change will succeed. 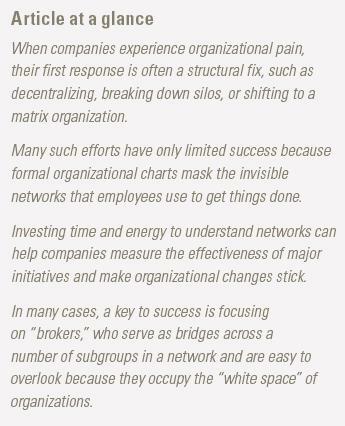 Focus on points in the network where relationships should be expanded or reduced. Imagine that, by studying its company’s informal network, management notes that old personnel are extraordinary well connected and central to collaboration, while many newcomers are stuck on the periphery. One way of boosting collaboration may be to launch “mentoring programs”: people central to collaboration may mentor new employees, and that may break down barriers that had imposed organizational rigidity and inhibited collaboration. Measure the effectiveness of major initiatives. 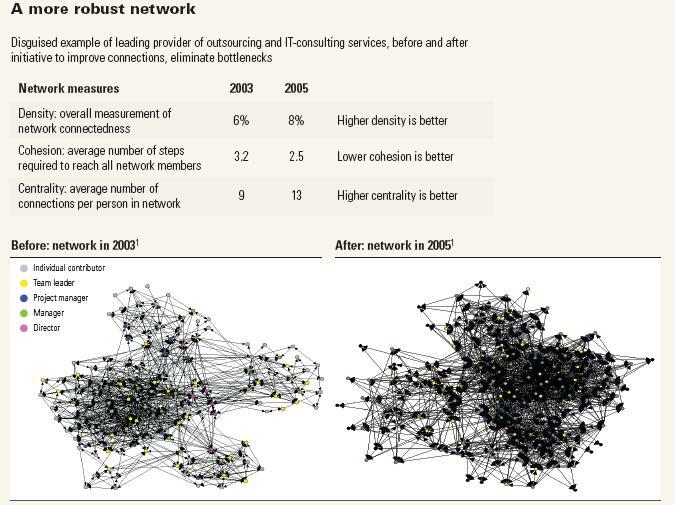 Using informal networks, companies have a way of measuring the impact of a change in their organizations. By measuring key network metrics (such as density, cohesion, and centrality) before and after a change (see McKinsey exhibit below), companies can asses whether the change has had a positive impact. For example, if after the introduction of a mentoring program, the network shows lower cohesion, then one may conclude that the program worked in that it has reduced the number of steps for any individual to get in touch with a colleague. This entry was posted on Thursday, July 3rd, 2008 at 2:03 am and is filed under industry, mobile, social networks. You can follow any responses to this entry through the RSS 2.0 feed. Both comments and pings are currently closed.